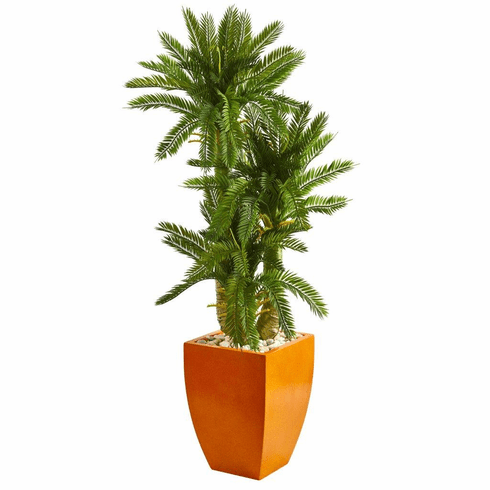 Standing in a warm orange planter, the 4.5’ triple cycas artificial plant has lush green fronds that feather out beautifully from their large trunks. With its bold appearance, this 4.5-foot ornament will create a wonderful statement in your home and office. To create the perfect retro look in your living room, try combining this piece with other artificial trees and settle them next to your blue sofa set. Height: 4.5 Ft., Width: 29 In., Depth: 29 In., Color: , Pot Size: H: 15.5 In. W: 11.5 In. D: 11.5 In.